If you wonder why a compressor regulator leaks, you have come to the right page. Read, on find out how to fix it, too! Here’s typically why a compressor regulator leaks, and what you can do about it. If doesn’t happen often, but when it does, it wastes expensive compressed air and causes your air compressor to cycle more frequently than necessary resulting in energy loss and wear and tear on the compressor. If you are not certain about what component on your air compressor is the air regulator, here is a complete overview of what the air regulator is and what it does on this website. Air Regulator Leaks For Just A Moment? Sometimes a compressor regulator, one like the regulator in the image, will leak for a moment or two. If that happens, it’s normal and no cause for concern. Why does the regulator leak periodically? The reason is that most air compressor regulators are designed to vent, or relieve, when downstream pressure is higher than the new regulator setting. How does downstream air pressure get higher than the setting on the regulator? If your regulator was set at 125 PSI for example, and you wanted to dial down the setting to 100 PSI, you would have air in the air line downstream of the regulator at the original 125 PSI.If that was, for example, a 100′ x 1″ air hose, that’s a lot of air at a too high setting. If whatever you connected your air line to was susceptible and possibly damaged by higher pressure than the new 100 PSI setting, that 125 PSI already in the hose might cause a problem. As soon as an air regulator is dialed down from a higher to a lower setting, all of the higher pressure air in the air hose will vent back up and out the vent on the regulator, until the downstream hose pressure is the same as the new regulator setting. By venting that higher air pressure out of the regulator relief hole as the downstream setting is turned down, the downstream air pressure will drop quickly to the 100 PSI of the new regulator setting and not leave higher pressure trapped in the line to possibly cause issues. If it is this venting process that suggests to you that your regulator is leaking, it’s not. It is operating normally at this point. The scenario that concerns us is one where air can be felt blowing out of the air regulator, and this leaking air continues whether the air compressor is running, or has reached cut out pressure and stopped. In other words air leaks out of some part of the regulator all the time there is air in the tank. Most regulators have a diaphragm inside them. It is on this diaphragm that the air pressure, in the line from the tank to the air tool, acts. We’ll not discuss this operation of the air regulator further here, as this is covered in the information page on air regulators linked from earlier in this article. 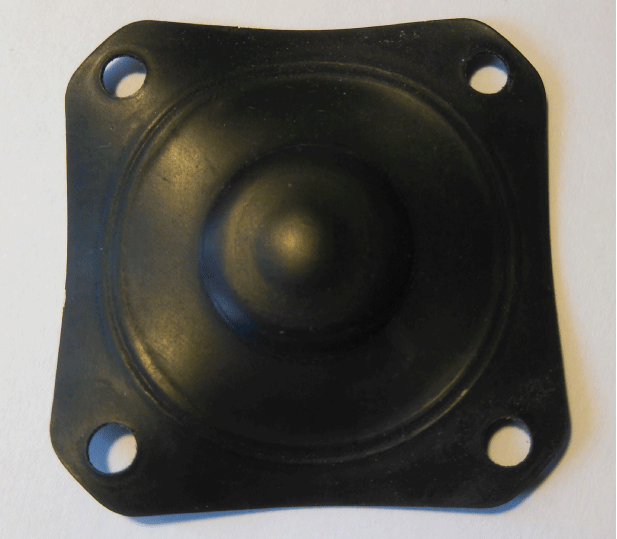 Whether it be a reaction to the compressor lubricating oils, which are not compatible with many forms of rubber, diaphragms, or just stress from too many cycles of increasing and lowering pressure, sometimes this diaphragm inside the regulator cracks and leaks. One air regulator diaphragm is shown in this next image. When this diaphragm cracks, air can flow through it, up the regulator housing, and out of the relieving hole or flow out from under the adjustment knob. This will happen all the time whether the compressor is running or not, as long as there is air in the tank. The compressed air will leak until the pressure in the tank drops to the pressure switch cut in level, the compressor will start, and since the crack in the regulator diaphragm typically isn’t a large one, the tank will fill to cut out and the compressor motor will stop. The leak will continue, however and this cycle will repeat. If the leak in the air regulator diaphragm is large enough, the compressor will run and run, but the pressure in the tank will never get to the normal cut out pressure as much of the compressed air is leaking out of the regulator. Depending on the size of the regulator in question, and whether it’s a low-cost, made-in-China chunk of crap or a name-brand that may, coincidentally, also be made in the Orient, you may or may not be able to get parts for the regulator to enable you to disassemble it and replace the diaphragm. That being the case, it’s time to replace the regulator. 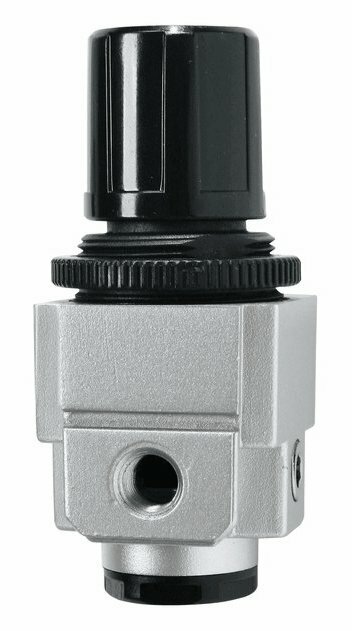 The mini-regulators are available from many locations including on line, and are not expensive. Often you can acquire one for under $15 plus shipping. Better replace the regulator I say, than waste the time and energy trying to find parts, and then figuring out how to disassemble and then reassemble a compressed air piece of equipment that you may not be at all familiar with doing. That’s my feeling anyway, unless it’s a $100 regulator from an industrial source, that is, but then, those sources will have parts and instructions on how to fix them, too. There is another regulator page on this site that offers lots more info about compressed air regulators right here. If, however, you wish to add a question right here, please do so. Wondering Why A Compressor Regulator Leaks? Leave a question here, and please upload a photo of the problem area.